The Atman Almighty for Dry Vaporizer with a revolutionary design, with a mini grinder built in and storage chamber. It is intelligent LED display and advanced temperature settings, ranging from 200â„‰ â€“ 510â„‰, let users experience the power of a high quality vaporizer in a convenient package. While its 2200mAh battery keeps it performing throughout the day, and provides powerful performance for use. 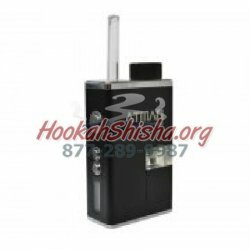 The Almighty is the one of the most advanced electronic vaporizer box kit, it is truly the ultimate combination of elegance and innovation. 1, Fill the dry into the grinder holder ,grinding it. 2, After grinding, press the handle of grinder, to drop the into the storage chamber. 3, Click the button1 for 5 times to turn on/off. 4, Click the button 2 to increase temperature or click the button 3 to decrease temperature. 5, After you choose the temperature you want, hold the button 1 for 2 seconds, it will make the device into heating and the temperature number is running up on the display. It will reach the temperature you set in 10~15 seconds and the number will stop running. It will last as long as 5 minutes for smoke. 6, After 10 minutes later, the device will shut off automatically to save power and prevent over smoke. 7, When the heating element cool down, clean chamber by brush. Please pay more attention not to breaking the heating element when cleaning. Connect the USB cable to the port at the bottom of the device and then connect the cable to a manufacturer approved mains adaptor. The LED light will turn red, and when it is full-charged, it will turn green. It will take approx. 3 hours to fully charge via a 1A mains adaptor and USB cable. Disconnect the charging cable once fully charged. Hold the button1 and button2 at the same time for 3 seconds to set the degree display in Fahrenheit / Centigrade. Low Voltage Protection: When the voltage drops below 3.3v, the device will no output ,and red LED display 8 times warning . Need to charge . Protectionï¼šThe device will be shut off automatically if it is not under the charging or smoking more than 60 seconds. To save power and protect the device .